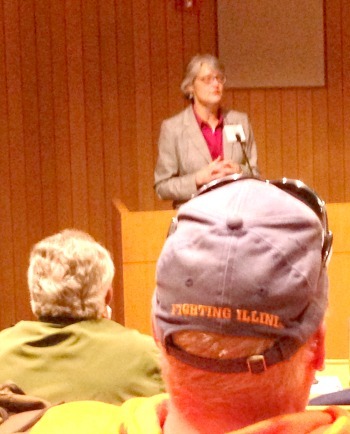 Edith Makra, chairperson of the Illinois Wood Utilization Team, overviews full circle urban forestry. 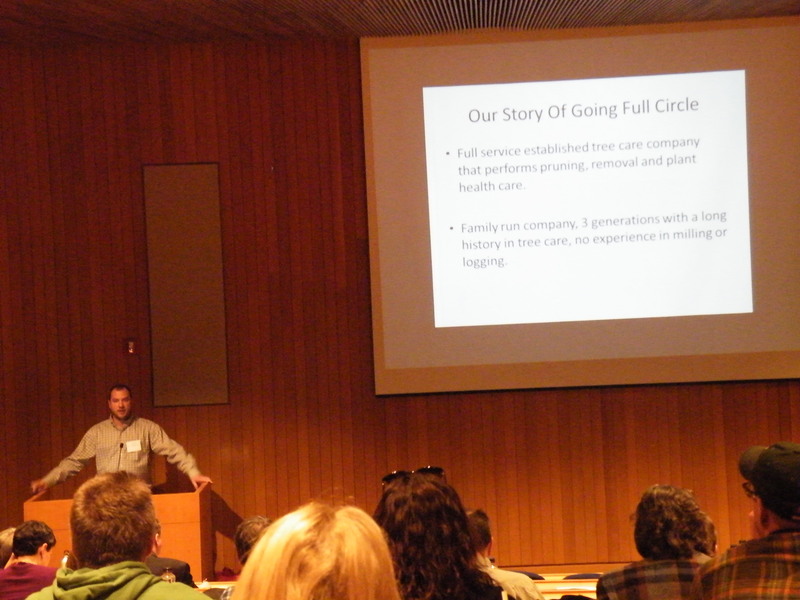 A diverse audience made up of arborists, sawyers, woodworkers and more attended the Full Circle Conference. 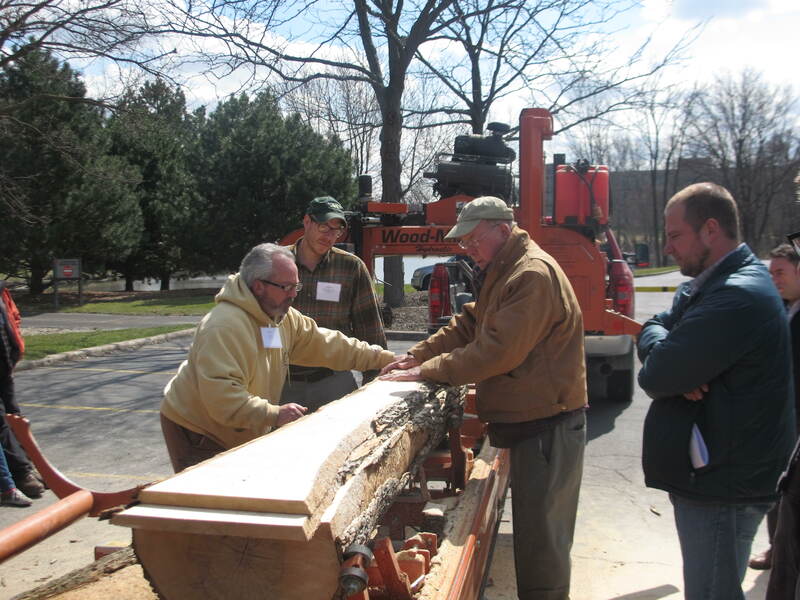 Prof. Dan Cassens conducts a sawmill demo. Ian Brown discusses Milwaukee’s commitment to converting felled city landscape trees into lumber. Networking was a huge component of the event. 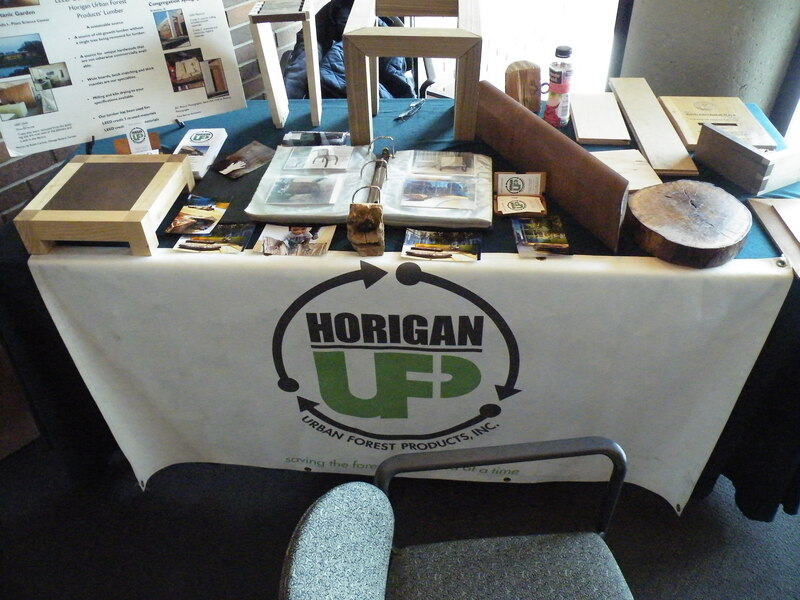 Horigan Urban Forest Products displays a wide range of urban lumber products and services at the Full Circle Conference. August Hoppe explains how his tree care service business got into retailing urban lumber. 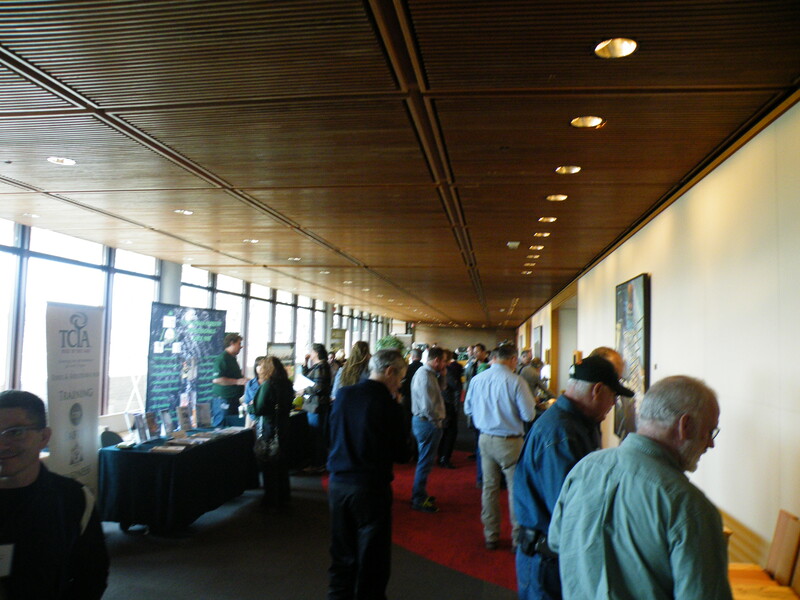 The Full Circle Conference featured an Urban Wood Products Showcase. Arborists, foresters, sawyers, architects, woodworkers and other professionals came together at the Bringing the Urban Wood Full Circle Conference to learn and share ideas for propelling the urban wood market. The unique conference focused on converting community trees into lumber and wood products. 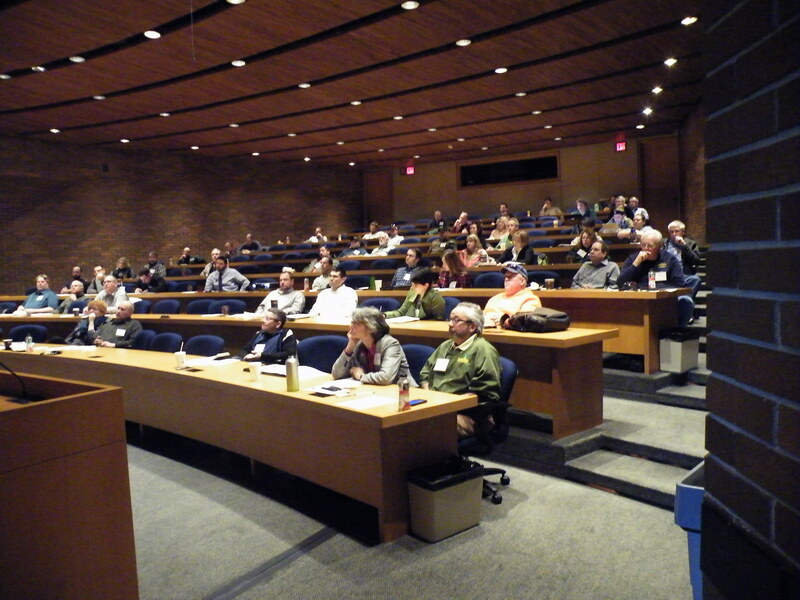 It was presented by the Illinois Wood Utilization Team March 18 at Hamburger University on McDonald’s corporate campus in Oak Brook, IL. Sponsors included Horigan Urban Forest Products, the Wisconsin Arborist Association, Sterling Tree Solutions Meyers Woodworking & Lumber, Graf Tree Care. While most of these diverse conference delegates hailed from the greater Chicago area, others traveled from southern Illinois, Indiana, Michigan, Wisconsin, Minnesota, Kansas, Nebraska and even Ontario, Canada. Edith Makra, chairperson of the Illinois Wood Utilization Team, kicked off the conference noting that there is an estimated 3 to 4 billion board feet of lumber potentially available from the nation’s urban forests. Capitalizing on this greatly underutilized raw material would require local markets throughout the country to strengthen their links in the chain from land managers and tree care services to sawyers and woodworkers. Ian Brown, urban forestry district manager for Milwaukee, discussed how Milwaukee is diverting 100% of its logs to local sawmill and in the process reducing disposal costs by 50%. In a similar vein, John Lough, senior city forester of Chicago, shared the Windy City’s urban log removal and reclamation plan. Separate presentations by August Hoppe, president of Hoppe Tree Services and the Urban Wood Lab in Milwaukee, and Jessica Simons, coordinator of Michigan’s Urbanwood Project based in Ann Arbor shared different models for developing retail outlets for urban wood lumber, slabs and wood products. Three architects participated in the conference. Laureen Blissard, principal of LTBL Envirotecture presented how urban wood fits into sustainability building programs including LEED. Jeff Perkis, senior project manager for Chipman Architecture Design and owner of Story Wood, recounted how dozens of hardwood trees downed in a freakish 2011 storm in West Chicago were salvaged and turned into furniture and other wood products. 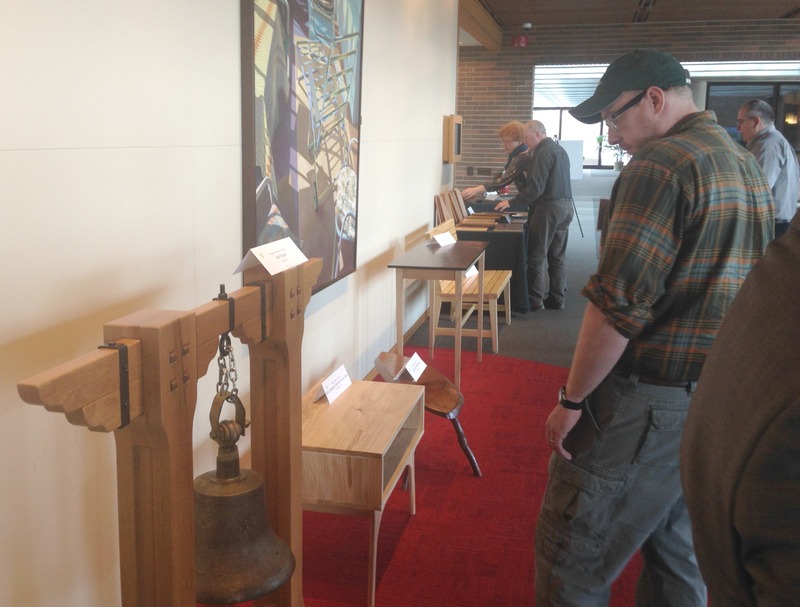 One of the most recent is a bell stand Perkins made for the West Chicago museum. Architect Paul Pettigrew, also an associate professor at the Illinois Institute of Technology, showed more than 100 slides of projects made by his students of his popular furniture and architecture class over the years. Ken Wier, owner of i2i Design, told the audience why he loves making furniture from urban wood because of its rich and often unpredictable splendor compared to hardwoods harvested from traditional forests. Wier’s discerning customers include Starbucks, Mariano’s and Freshii. Mike Dimitroff, manager of art initiatives for the Chicago Park District, showcased a variety of projects that use wood reclaimed from city parks including the Bears Den at Solider Field and at CPD community wood shops. Dimitroff was joined by Jim Semelka, urban forestry advocate for Sterling Tree Solutions, to discuss how the public and private company partner on urban wood tree reclamation programs. Dimitroff also showed how thermally modified urban wood is being used as a decking material for the CPD’s harbor dock. Brian Mitalo, regional salesperson for Tourneslol Siteworks, which makes outdoor furniture and more from thermally modified lumber TML), agreed that there is great potential for converting urban wood into TML. Prof. Dan Cassens, wood extension specialist at Purdue University, pulled double duty. 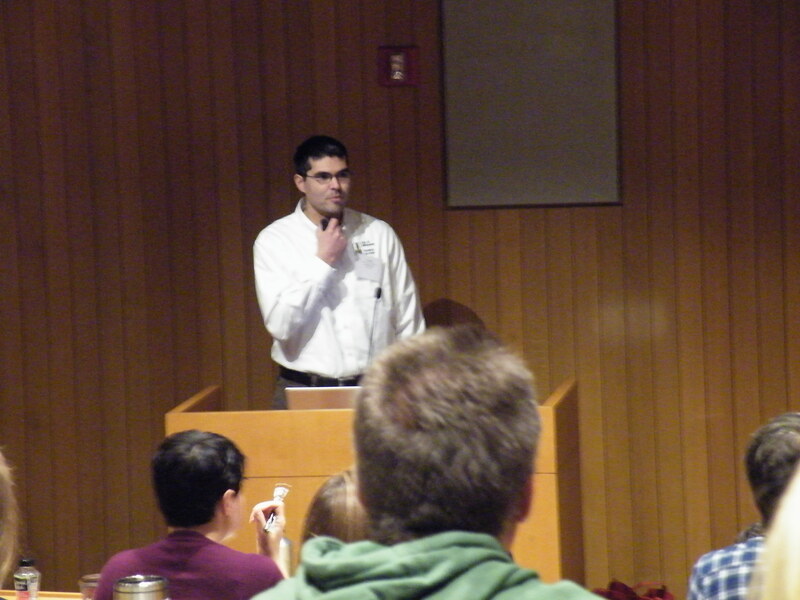 First he lectured on how urban wood sellers can compete with traditional hardwood lumber and wood products by not only being novel, but by being nimble. Cassens also conducted a live portable sawmill demonstration using logs generously donated by Ron Meyers of Meyers Woodworking & Lumber of Batavia, IL. Rounding out the event were plenty of networking opportunities, including a networking featuring table top exhibits and more than a dozen furniture and other items displayed in the Urban Wood Products Showcase. The Bringing the Full Circle Conference was preceded by an all-day Hardwood Lumber & Sawmill Workshop instructed by Prof. Dan Cassens, wood products extension specialist at Purdue University. THANK YOU CONFERENCE SPONSORS & PARTNERS!